UT Dallas professor Dr. Mathukumalli Vidyasagar was recently chosen to be part of the first exclusive group of scientists that will work in Indian laboratories during an intensive, 12-month fellowship. Sponsored by the Indian Government, this new fellowship is designed to foster proven scientists and researchers who can actively assist in promoting advanced scientific research within the country. 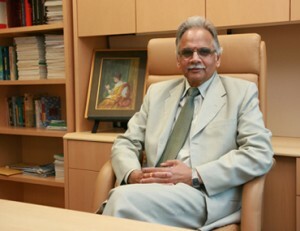 Vidyasagar is highly respected for his contributions in robotics, statistical learning theory, and computational biology research. His current research at UT Dallas is focused on using statistical learning theory and computational biology to achieve personalized therapy in cancer, and his work is being developed along with other scientists from UT Southwestern. Vidyasagar’s team has developed algorithms that can be applied to the diagnosis and treatment of lung, ovarian, and endometrial cancer — three cancer types that UT Dallas researchers have previously studied. The algorithms discovered by Vidyasagar’s team of scientists will allow them to identify patients’ response to a therapy. Vidyasagar, who is also a Fellow of the Royal Society, another essential prerequisite to be elected to the fellowship, has been fully dedicated to cancer therapy research since last July when he left as head of the bioengineering department of the University of Texas. The group of scientists chosen to this fellowship will work in Indian laboratories for a total of 12 months, which will be spread out over three years.